Home » Favorite Recipes » No Time Taco Soup – make a quick and easy soup that is tasty and ready in just a few minutes. 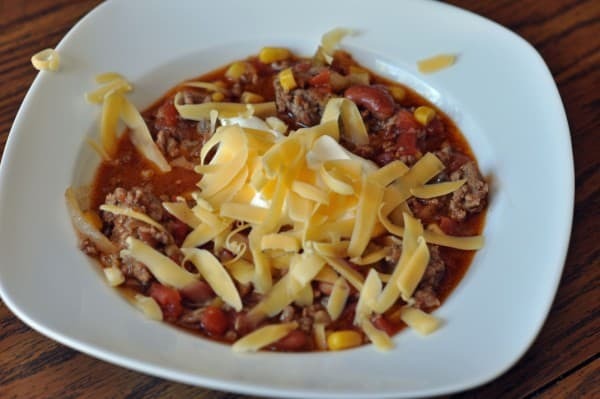 No Time Taco Soup – make a quick and easy soup that is tasty and ready in just a few minutes. Taco soup makes a quick Mexican meal! You don’t need to get takeout, you can make this soup faster than you can get in your car and go to the drive-through. You can make this soup in about the time it will take you to leave the house and come back home. Looking for a dinner that is filling, and tasty? This No Time Taco soup is perfect, you don’t even need to be a good cook to make a tasty pot of soup. In about 30 minutes you will have a hearty bowl of soup that will feed some hungry people. This recipe is very flexible if you have some extra onions and/or peppers chop them up and throw them in the pot while cooking. I hate to confess how many times I have made this quick and easy soup, it makes a filling meal. Chances are you have most of these ingredients already on hand. This soup is almost like a chili. It is filled with ground meat, corn, beans, stewed tomatoes. I always keep cans of beans, corn, and tomatoes in my pantry. I love to buy them when they go on sale. I think that these are great staples to have on hand. This Taco Soup tastes great when reheated the next day, in fact, this is one of those dishes that tastes better on day 2. I love to bring this soup for to work for lunch. I also like to serve this soup with some crispy corn chips and garnish it with some sour cream and grated cheddar cheese. Make a quick and easy soup that is tasty and ready in just a few minutes. Dump everything but cheese and chips together in a large pot and simmer approximately 20 minutes. Thanks to demaine for sharing this recipe. I think she’s referring to your sentence in the post, where you must’ve typed “refrigerator” when you meant to type “pantry.’ Some people have too much time on their hands 🙂 And most all know you don’t keep cans in the refrigerator….. I do this one a little different after MANY batches of trying to make it better. (It is better though if left to simmer, or as left overs!) First I use real onion, and then brown the beef with it. I also add a little pork 1/3 to 2/3rds beef. Next I put in rotel tomatoes instead of taco mix. (Cuts the sodium and adds more flavor) And the last time I made it, I put in this corn almost corn salsa instead of plain corn. Was another level of “yummy” It is easy to make fast, but as I said so much better if left to simmer a few hours, and even better as leftovers. I love to use “scoops” instead of chips!! It’s a great winner for potlucks too! Lots of great suggestions thank you for sharing! I use a 2/3 pound beef, 1/3 pork, I don’t do the taco mix, (too full of chemicals, salt, ect) I use Rotel instead. (Lime and Cilantro is the best) but you can pick out “mild” to hot this way too. And I use fresh onion, just tastes better. The last time I made this I used a Corn/salsa instead of plain corn, was SUPER good. it’s fun to play with this and make it your own… more spicy, ect ect. The best! I used a 14.5 oz can chopped tom and the rest rotel and instead of corn I used hominy! Very good! It sounds like that would be closer to pesole then. Also subbed rotel for the tomato sauce. Also added orange and yellow peppers, onion and dry ranch packet. Yummy!!! I am sure it was great. This soup is kinda of like chili. I make this all the time, but I add 1 can of pinto beans, and a package of ranch salad dressing mix and it is amazing! I also top with sour cream along with the cheese and tortilla strips. Oh yeah, and I use 1 can of original Rotel instead of tomato sauce. This soup is great. We also add a package of ranch salad dressing mix (the powdered kind)to the ground beef. HAS ANYONE EVER PUT POTATOES IN THIS SOUP? THIS RECIPE SOUNDS WONDERFUL. DO I DOUBLE EVERYTHING IF I WANT MORE? This recipe doubles very well. I have not added potatoes, but if you do I would add some additional water, this soup is fairly thick. I have tweeked this soup some more. I have added a can of black beans plus a can of Bush’s Grillin Beans – Black bean fiesta, plus some red and green peppers while I am browning the meat. Don’t drain the beans !! Those sound like some really nice tweeks you have made. I was wondering how those Bush’s Grillin beans tasted, but I can see you gave them your seal of approval. I’ll often throw in other random veggies that are in my refrigerator. What size cans of corn, beans, and tomato sauce? For the cans with the exception of the tomato sauce, use the 14.5 – 15 ounce cans. Different manufactors put their food in different size of cans. You know this recipe is highly flexible. I normally use this use to help me clean out my pantry. I’VE BEEN MAKING THIS SOUP FOR YEARS. IT’S WONDERFUL!.. BEEF OR CHICKEN BROTH SUBSTITUTED FOR WATER ADDS MUCH FLAVOR. ANY BEAN WORKS JUST FINE! WELL, NOT GREEN ONES, OF COURSE! I like this it is quick and easy! replaced black beans for kidney or you could substitue pinto.. I made this soup and it was great. I made one adjustment and that was adding a chopped onion when I was browning the ground beef. I also drained the ground beef before adding the rest of the ingredients. It is a keeper soup for us. I’m beginning to think that the people that post "Mexican" recipes that use kidney beans are from up North. Substitute kidney’s with Ranch Style or Pinto. We really like to spice this one up by substituting ranch style beans for the kidney beans and adding 2-3 ancho chilis in adobo. Yum! The corn really cuts the heat as does the cheese…can be left out without missing it!